We’d love your help. Let us know what’s wrong with this preview of Tell Me Where It Hurts by Nick Trout. To ask other readers questions about Tell Me Where It Hurts, please sign up. One day in the life of a veterinary business. There were some interesting stories, but nothing out of the ordinary. What elevated the book for me was that it was a buddy read with my friend Sheila who has worked in both the practical and business side of veterinary medicine. One of my cats, Talullah, suffered an agonising death when the vet couldn't find a vein to pop the 'going to sleep forever' medicine in. I wasn't there but it was so traumatic my son still can't speak of it. So I learned exa One day in the life of a veterinary business. There were some interesting stories, but nothing out of the ordinary. What elevated the book for me was that it was a buddy read with my friend Sheila who has worked in both the practical and business side of veterinary medicine. 3.5 stars, but I just can't give it 4 stars. It is an interesting look at a modern vet & his hospital where he specializes in surgery on dogs & cats. There are plenty of references to Herriot & I think he wanted to write in that vein, but the tone was too uneven & he is too callous to carry that off. He didn't get the people the way Herriot did, although he does describe them superficially quite well. Marg tried reading this, but put it down about a quarter of the way through, ab 3.5 stars, but I just can't give it 4 stars. It is an interesting look at a modern vet & his hospital where he specializes in surgery on dogs & cats. There are plenty of references to Herriot & I think he wanted to write in that vein, but the tone was too uneven & he is too callous to carry that off. He didn't get the people the way Herriot did, although he does describe them superficially quite well. Marg tried reading this, but put it down about a quarter of the way through, about the worst part of the book. (view spoiler)[He cheerfully tells a resident that it was OK to run hundreds of dollars in unnecessary tests because the dog's owner will be so thrilled that it doesn't have cancer! IOW, his true character really shines through. (hide spoiler)] That turned Marg off completely. I continued on & am glad I did. It never wowed me, but it was worth it. From a factual standpoint, it was quite interesting, if a bit scattered. Normally, I'd say that would help make the facts easier to digest, but he'd go off on tangents for too long, especially if I could read for only a short time. Still, many interesting facts & opinions came through. While I didn't agree with many the latter he made some wonderful points to ponder. He is one of the people who is helping Americans spend an unprecedented amount of money on pet health care. He routinely did $5000 operations on animals that didn't have a great chance of recovery nor long to live. He's OK with that & explains his reasons. I didn't find those reasons very compelling, but it is how he makes his living, so I suppose he had to rationalize it. Still, he's against ear & tail docking, his case against it was not only superficial, but wrong in some of the facts & was entirely at odds with his case for multiple surgeries on a dog with mere months to live. I found that rather chilling as his ego overrides his professed compassion. As I was walking through Borders, during a rare moment of free time from my first year of veterinary school, I stumbled upon this book and bought it without a second thought. A decision I don't regret. I would highly recommend this book to anyone who is considering a career in veterinary medicine or who is currently in veterinary school and needs their struggles to be put into perspective. Fear not, for those of you who are animal lovers and may not be knowledgeable about medicine, Dr. Trout doe As I was walking through Borders, during a rare moment of free time from my first year of veterinary school, I stumbled upon this book and bought it without a second thought. A decision I don't regret. I would highly recommend this book to anyone who is considering a career in veterinary medicine or who is currently in veterinary school and needs their struggles to be put into perspective. Fear not, for those of you who are animal lovers and may not be knowledgeable about medicine, Dr. Trout does not overwhelm the books with medical jargon that is not clearly explained in layman terms. An excellent book all around! Tell Me Where it Hurts had lots of funny anecdotes, heartwarming stories as well as its fair share of heartbreaking moments, and an overall inspirational feel to it. I truly love animals and had even once considered becoming a veterinarian myself when I was a little kid, so I hold this book in very high regards due to its subject matter (though, you do not need to have an interest in veterinary sciences to enjoy this book to its fullest extent). I know that anyone w An excellent book all around! Tell Me Where it Hurts had lots of funny anecdotes, heartwarming stories as well as its fair share of heartbreaking moments, and an overall inspirational feel to it. I truly love animals and had even once considered becoming a veterinarian myself when I was a little kid, so I hold this book in very high regards due to its subject matter (though, you do not need to have an interest in veterinary sciences to enjoy this book to its fullest extent). I know that anyone who cares for animals or has pets of their own will easily connect with Dr. Trout and his treasure trove of animal "tails" (forgive the pun). You will find a range of stories included in this memoir involving a variety of animals and their equally interesting owners. Of the stories included, I especially enjoyed reading about how Dr. Trout came around to becoming a veterinarian when he was inspired by following one for a day (as reluctant to do so as he was initially). Throughout this book, I felt like I was with Dr. Trout in the animal hospital meeting the animals, preforming the surgeries, experiencing the accomplishments as well as the losses, and going through the roller coaster ride of emotions that follows suit in such a profession. Definitely a powerful book that will not leave you out of the action. I disagree with a lot of previous reviews of this book. In 280 some odd pages, Nick Trout has managed to accomplish the seemingly impossible and find words to describe the indescribable relationship between owner and pet. Seldom has an author been able to take something so abstract and create something tangible. 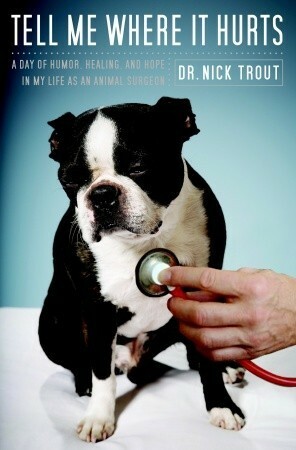 This book is less of a day in the life of a veterinarian than a collection of anecdotes and memories. Nick Trout chose to write it in this manner in order to cleverly convey the normal he I disagree with a lot of previous reviews of this book. In 280 some odd pages, Nick Trout has managed to accomplish the seemingly impossible and find words to describe the indescribable relationship between owner and pet. Seldom has an author been able to take something so abstract and create something tangible. This book is less of a day in the life of a veterinarian than a collection of anecdotes and memories. Nick Trout chose to write it in this manner in order to cleverly convey the normal hectic pace of every day at the hospital. All of these events may not have occurred on the same day in reality, but they are meant to tie together Dr. Trout's most prominent memories to resemble his every day life. Having spent hours in veterinary hospitals with various pets over the years, I am always curious about the lives on the other side of the table - the veterinarians. Their diagnoses are made often solely on observation, because their patients obviously can't communicate verbally about their distress (hence the ironic title.) 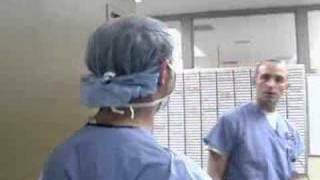 And so Tell Me Where It Hurts revolves loosely on several different cases Trout, an orthopedic surgical specialist, sees in the course of a day. Unlike many works of nonficti Having spent hours in veterinary hospitals with various pets over the years, I am always curious about the lives on the other side of the table - the veterinarians. Their diagnoses are made often solely on observation, because their patients obviously can't communicate verbally about their distress (hence the ironic title.) And so Tell Me Where It Hurts revolves loosely on several different cases Trout, an orthopedic surgical specialist, sees in the course of a day. Trout weaves his insight and perspective into the various issues vets must face (such as performing euthanasia, the rising costs of veterinary medicine, the difficult task of introducing poor prognoses to loving owners) in with anecdotes about his life growing up, his work as a student vet, and the case load. Some readers have complained that the effect is disjointed, but it read much like a real vet going through an actual day, where multi-tasking several animals throughout their treatments and recoveries is a must. That, interspersed with rounds and other conversations, is simply how vets work. I know the average reader will go to this book for cutesy animal stories and they are there. For me, the read was therapeutic in a sense. It’s nice to hear that these sort of scenarios go down in other hospitals. There’s emergencies in the middle of the night, surgeries to remove the most disgusting things from intestines, owners who can’t stop trying to find a cure and people who think that veterinary medicine is a waste of the consumer’s money. Veterinary medicine has challenges by the boatload I know the average reader will go to this book for cutesy animal stories and they are there. For me, the read was therapeutic in a sense. It’s nice to hear that these sort of scenarios go down in other hospitals. There’s emergencies in the middle of the night, surgeries to remove the most disgusting things from intestines, owners who can’t stop trying to find a cure and people who think that veterinary medicine is a waste of the consumer’s money. Veterinary medicine has challenges by the boatload. We practice on a wide spectrum of species. We meet people who want to do everything for their pet but don’t have the money. There are people with tons of money but would never spend it on a dog or cat. You’ll see cases that you know are doomed from the start, but sometimes you’ll have miracles pull through when you least expect it. All of this plus being constantly sprayed with some sort of bodily excrement and still being able to smile when people refer to MD’s as real doctors. I found myself crying during several stories and laughing uncontrollably at others. (The Jack Russler story… hilarious!) All of the stories in the book do not actually take place in the ‘Day Of Humor, Healing And Hope’. As he takes on each new case, he recalls other similar cases. Anyone who has spent time with a veterinary crowd knows that one story leads to another story that leads to another. I saw some reviewers found this sort of story telling awkward. I guess it came naturally to me. Listened to this on cd and found it just charming. A great glimpse into the life of a small animal vet, and into his head and heart as well. He deals with the dilemma of whether to keep pets alive, sometimes at significant costs. as opposed to euthanizing and ending their pain. Of course, there is no hard and fast rule; it's a judgement call, and it's often very tough. In spite of the sometimes very serious subject matter, the book is written with humor and sparkle and is generally upbeat ... a Listened to this on cd and found it just charming. A great glimpse into the life of a small animal vet, and into his head and heart as well. He deals with the dilemma of whether to keep pets alive, sometimes at significant costs. as opposed to euthanizing and ending their pain. Of course, there is no hard and fast rule; it's a judgement call, and it's often very tough. In spite of the sometimes very serious subject matter, the book is written with humor and sparkle and is generally upbeat ... a very enjoyable and enlightening read. Not sure if it was read by the author himself, who is British, but the British accent is an added bonus .... what is it about English accents that I find so irresistible? Some nice animal stories, and not a bad read, but the writing is awkward and the book has no focus. It tries to cover too much territory for a short book and becomes a random collection of largely unsatisfying anecdotes. The author is a veterinary surgeon who performs expensive procedures on pets, and he does demonstrate the controversy behind this, albeit without an in-depth discussion. For instance, he tells the story of an old man who is willing to spend money he can hardly spare on a complex, Some nice animal stories, and not a bad read, but the writing is awkward and the book has no focus. It tries to cover too much territory for a short book and becomes a random collection of largely unsatisfying anecdotes. The author is a veterinary surgeon who performs expensive procedures on pets, and he does demonstrate the controversy behind this, albeit without an in-depth discussion. For instance, he tells the story of an old man who is willing to spend money he can hardly spare on a complex, risky procedure to save the life of an elderly dog. Read as an audiobook. The reader does an excellent job bringing this story to life. Since I am a veterinarian the information about the cases isn't foreign and I understand how telling the story of one case leads into the other stories Dr. Trout tells. Truly, this is what "a day in the life is like." For example, every time you see a GDV you immediately reflect back to all the failures of your previous similar cases and the only revisit the successes after that. You instantly reflect on what you Read as an audiobook. The reader does an excellent job bringing this story to life. Since I am a veterinarian the information about the cases isn't foreign and I understand how telling the story of one case leads into the other stories Dr. Trout tells. Truly, this is what "a day in the life is like." For example, every time you see a GDV you immediately reflect back to all the failures of your previous similar cases and the only revisit the successes after that. You instantly reflect on what you learned from each case to do better for the next. Also, it is just enjoyable hearing the patient signalment and making a diagnosis before the big reveal in the book. I think every pet owner should read this book to understand what an emotionally and intellectually taxing profession this is. Dr. Trout kindly addresses throughout the book the causes of burnout in the veterinary profession. He also passes on all the craziness and chaos we see in a day. He says the things your vet wants to tell you but doesn't have the courage to communicate. Ultimately this is a book for animal lovers. If you feel like your pet is "just a dog/cat" then this story isn't for you. Many reviewers felt these stories were unbelievable or tragic. Here is the big news, this is exactly what happens all day long in specialty veterinary clinics and teaching hospitals. A surgeon, resident, intern can be managing on a rotation a patient with every single one of these cases all at the same time, have to see to their medical plans, communicate with those owners, be in those surgeries, be in radiology, be in special procedures, write chart, do treatment plans, work on their research, study for boards. To say this book is unrealistic or unbelievable is a great reason for it to have been written. This is exactly what life is like in a referral hospital. Speaking to the tragedy of these cases, surgeons do see all the hardest cases because they are beyond the scope of us general practicioners. They see the highest risk cases, but also get to see the great rewards. They also do it for 1/10 to 1/4 of the cost of human healthcare despite using all the same equipment, greater overhead and more, rather than less doctor patient time! The subtitle really says it all: A Day of Humor, Healing and Hope in My Life as an Animal Surgeon. 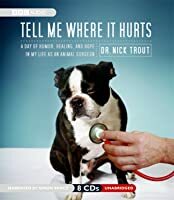 Trout uses a “day-in-the-life” structure to relay various stories from his experience as a veterinary surgeon in Angell Animal Medical Center in Boston Massachusetts. He tells the reader in the introduction that the stories he relates are composites and examples of the cases he has dealt with. I was expecting something in the way of James Herriott’s memoirs, but Trout isn’t anywhere near so good a writer. I will admit up front that I am not an animal lover. I like animals just fine, but I’m not sentimental about them (and, yes, I grew up with a succession of dogs as beloved family pets). So for me to be really involved in a book about pets and their owners, I need a writer who somehow makes the subject more universal. This book just didn’t do it for me. I didn’t find anything particularly humorous or entertaining. I was mostly bored. Simon Vance narrated the audio version. I think he did a creditable job, but he really didn’t have great material to work with. Never judge a book by its cover! I was expecting a warm and fuzzy day-in-the-life-of saga. What I found instead, was a thoughtful, funny and sometimes illuminating look at veterinary medicine, specifically veterinary surgery. Perhaps more importantly though, this was also a book about relationships - between owner and pet, owner and vet, vet and pet. To be sure, this book is not without its faults. Dr. Trout's writing style is very tangential in nature which often makes it difficult to figure out Never judge a book by its cover! I was expecting a warm and fuzzy day-in-the-life-of saga. What I found instead, was a thoughtful, funny and sometimes illuminating look at veterinary medicine, specifically veterinary surgery. Perhaps more importantly though, this was also a book about relationships - between owner and pet, owner and vet, vet and pet. To be sure, this book is not without its faults. Dr. Trout's writing style is very tangential in nature which often makes it difficult to figure out where you are in the narrative - breadcrumbs should be required! Occasionally he also provides more information than necessary on a subject and, at least in my case, it tends to bog you down. Those quibbles aside though, I really did enjoy this book very much. I loved this book. I found it hard to put it down. Not only did you get to read about Dr Trout's experiences with the animals he helps, but he also talks of things like pet insurance, pet obesity, exotic animals and more. I found it very informative. If anyone owns a pet and/or is animal lover, this book is a must-read! I think the editors chose wrong, making this book an artificial "day in the life". Time in medicine, whether human or veterinary, is of major concern. How much time does the doctor spend with his patients? How much time is needed for a proper diagnosis? This writing choice, just gets the book and the reader off on the wrong foot. The one thing you want in a doctor and a writer is a sense of trust. I am conflicted about this book because I enjoyed the stories but found the in the author’s voice a narcissistic and misogynistic flavor complete with fat-shaming--so much so that I found myself yelling out loud at the book. I believe he cares about his furry patients but my guess is he’s not so great with people. Over all, this guy strikes me as the Donald Trump of veterinarians. I was disappointed by this book. When I picked it up I was hoping for more stories about the animals themselves, their struggles and triumphs. Instead the book is more about Dr. Trout himself and what it takes to be a vet. While that is interesting I think it took up more of the book than I wanted. Second cutest dog ever on the cover. Not all vets are going to be as good at being authors as James Herriot was. Not even every vet who tries to write a book will be able to pull off the magic Herriot did. Nick Trout certainly didn't. But he did manage to write a very readable, engaging, interesting, and thought-provoking book. I was startled by how fast I whipped through it. The stories of the animals themselves take center stage, as they should, and they were both enjoyable and occasionally heart-breaking, as expected in any book Not all vets are going to be as good at being authors as James Herriot was. Not even every vet who tries to write a book will be able to pull off the magic Herriot did. Nick Trout certainly didn't. But he did manage to write a very readable, engaging, interesting, and thought-provoking book. I was startled by how fast I whipped through it. The stories of the animals themselves take center stage, as they should, and they were both enjoyable and occasionally heart-breaking, as expected in any book about dogs and cats and their humans. The main problem with this book was its narrator. Trout's tone is at times unfortunately self-aggrandizing. It's hard to tell if that's how he is himself or if it's just the effect of trying too hard with the writing. Also, the conceit of the book as one day in the life of a veterinary surgeon was off-putting, clumsy, and completely unnecessary. Stories, information, and thoughts this engaging don't need an artificial framework to make them palatable. Trout also has an obvious difficulty writing about other people, and it's not clear whether it's because he's actually that patronizing or just comes off that way when describing people in prose. And I sure hope he's not as sexist as he comes off in this book. He probably thinks of it as "old-fashioned," "benevolent," or "passive" sexism, but its extremely grating and occasionally deeply insulting. All that, however, was not enough to spoil the essential charm of the book. Trout obviously cares very deeply about animal health and welfare, and he has a lot of very interesting, very thought-provoking things to say. His self-effacement (when it wasn't annoying) was appealing, and his acceptance of all pet owners and their quirks was wonderful to read. I heard the review on NPR and thought I'd enjoy it. It was a bit disappointing as his style was not to my taste. Pg 12"63% of US homes have a pet-may be a cat, bird, ferret or guinea pig but the chances are high that when someone close to you dies, a pet will be there to pick up the slack. Pets devour the loneliness. They give us purpose, responsibilitiy, a reason for getting up in the morning, and a reason to look to the future. They ground us, help us escape the grief, make us laugh and take fu I heard the review on NPR and thought I'd enjoy it. It was a bit disappointing as his style was not to my taste. Pg 12"63% of US homes have a pet-may be a cat, bird, ferret or guinea pig but the chances are high that when someone close to you dies, a pet will be there to pick up the slack. Pets devour the loneliness. They give us purpose, responsibilitiy, a reason for getting up in the morning, and a reason to look to the future. They ground us, help us escape the grief, make us laugh and take full advantage of our weaknesses by exploiting our furniture, our beds and our refrigerators. We wouldn't have it any other way. Pets are our seat belts on the emotional roller coaster of life--they can be trusted, they keep us safe and they sure do smooth out the ride." Pg 116 "When the cure for insecurity and meaningful conversation is to slap a cell phone against your ear, hide within your iPod or tap out a cryptic IM, is it any wonder that we find comfort and solace in hairy, furry and scaly companions? Far from the sleazy bar scene, blind dates and Web sites dedicated to finding your soul mate, pets offer a relationship guaranteed free from lies, deception, and infidelity where silence feels comfortable, where words come easily and unforce, where demands and a need for tolerance are nominal. . . .No prenup agreement. No worries about divorce. . . .here is a chance to find true love. Here is a chance to find love without the risk." I used to think I could become a vet. Blame James Herriot. I loved his book and I absolutely LOVED the program. To me Robert Hardy will always be Siegfried Farnon, and Peter Davison will always be his brother Tristan (not the Doctor). So, I was thrilled to start reading this. I lucked into this book. It was one of a stack of books my next-door neighbor gave me when I went to ask her for help with one of my dogs. My dog had started going a little lame and I was trying to find out if there was som I used to think I could become a vet. Blame James Herriot. I loved his book and I absolutely LOVED the program. To me Robert Hardy will always be Siegfried Farnon, and Peter Davison will always be his brother Tristan (not the Doctor). So, I was thrilled to start reading this. I lucked into this book. It was one of a stack of books my next-door neighbor gave me when I went to ask her for help with one of my dogs. My dog had started going a little lame and I was trying to find out if there was something I could feed her to help her arthritis. You may ask why not give her a pill? Well, that is a longish story and you may send me a note if you would like to know more. I was a bit disappointed by this book. The decision to fictionalize the work of several years in one fake day - well, I'm sure you get the vibe that I found it unbelievable & that it took away from the validity of what weren't really all that remarkable cases to me. It also wasn't all that funny. The best I can say about it is that the guy does seem to really love animals. Paints a fairly accurate picture of Angell Memorial Animal Hospital and the people who work there. Dr. Trout is a fantastic guy (he really does call all animals "Sweetheart" until they give him a good reason not to) and a great doctor. Maybe he's not a fantastic writer, but I admit that I didn't put the book down for two days and cried a few times. I found this book easy to read and enjoyable because 1. I think of my doggies as part of my family, 2. I have a fascination with the practice of healthcare, including the animal kind, and 3. I love the facial expression of the puppy in the cover. My middle-school non-fiction reader loved it. I thought it was OK. Definitely not up to the standard set by James Herriot for veterinary memoirs, but few are. I didn't get it finished but what I read was good. Many great stories, but lacked a bit of clarity. Jumping between so many stories muddled them at times and didn't allow me to connect fully to each one. The focus on both animals and clients was good, but the animals weren't actually the spotlight - the people and how decisions are made for animals seemed much more prominent. There were some amazing observations about the profession and about pet ownership that I really appreciated, and this will be a good book to come back to during times when Many great stories, but lacked a bit of clarity. Jumping between so many stories muddled them at times and didn't allow me to connect fully to each one. The focus on both animals and clients was good, but the animals weren't actually the spotlight - the people and how decisions are made for animals seemed much more prominent. There were some amazing observations about the profession and about pet ownership that I really appreciated, and this will be a good book to come back to during times when I am struggling to communicate with clients in the future. "Pets are our seat belts on the emotional roller coaster of life." "If this job came with tunnel vision our clinical judgment would be so much clearer."